The Wild Card boxing gym in Los Angeles, California, has brought many visitors over the years. Boxing enthusiasts, amateur and professional fighters, fans and media, Hollywood actors, all have visited the famous gym for a variety of reasons. 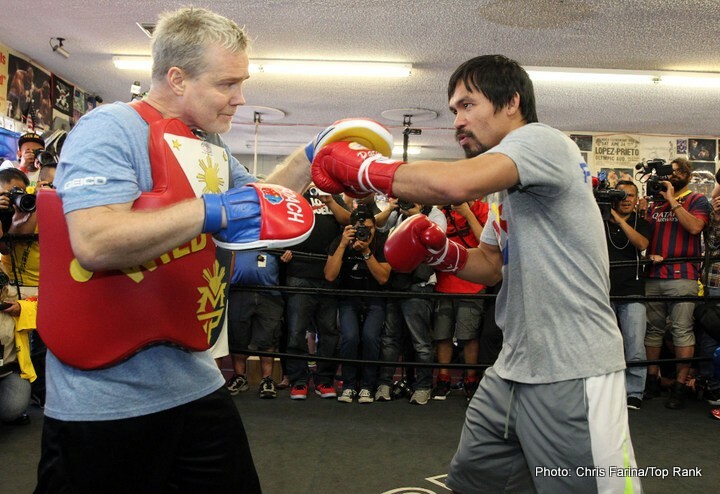 The owner and head trainer Freddie Roach has trained numerous world class fighters in that facility, including Amir Khan, Bernard Hopkins, Miguel Cotto, and who can forget his star pupil Manny Pacquiao. There are countless champions that coach Roach has chiseled, too many to mention. Apparently, lately Mayweather Jr. has been showing up at the Wild Card, suddenly, without reason or invitation. Of all the people, Floyd rarely makes it out to, nor cares, about any of his opponents’ training facilities, and life outside of the Mayweather Jr. promotions in general. Freddie Roach may be on to something, as coy as Mayweather Jr. is trying to be, it is highly likely that he has an alternative motive to the visits. “I don’t really know what he is up to but he does come to visit from time to time, which is surprising. But he’s not a bad guy one on one. Give him a TV camera and maybe that will change,” continued Roach. There has always been a duality in Mayweather Jr.’s character. He is a cocky villain under the lights, and a humble person when not promoting himself or his stable. He has matured over the years, and become more timid, but the businessman personality that if Floyd Mayweather Jr. is still very much ablaze. Could The Money Team be looking past McGregor and straight into a Pacquiao rematch? If Pacman is able to showcase himself in his fight against Horn, and display his aggression and even knockout ability, maybe Mayweather Jr. will once again believe that this fight will sell well enough for him to sign on.